How come Doki keeps releasing episodes of Nichijou right before the next one comes out? Just as I watched this, I noticed that HorribleSubs has released ep23 already. It doesn't really matter though; I'll be archiving Doki's version of this in the end, so I'll stick with them. Ah, Santa, causing so many family problems. This episode was exceptionally funny, generally focusing on "side characters" instead of the mains. Nakanojo was the main character of this episode (given his base premise of having a natural mohawk, I expected him to be a hilarious character to begin with). Weboshi and and Fecchan had their own scene, set right after Yoshino (Mio's older sister) and Mihoshi (Tachibana's younger sister) interacted with each other. 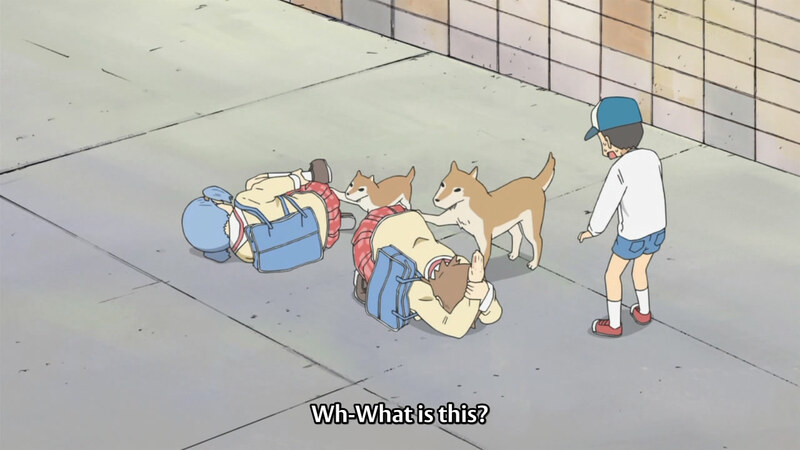 The final scene was based on Professor and Sakamoto encountering Mio and Yukko, along with Mai's dogs, which led to a good ending scene. After my strange dissatisfaction with last week's episode, I'm pretty happy with the quality of this one. A master must always protect his students. Yoshino turned out to be a genius (at kendo) in her scene with Mihoshi. She claimed that she got sluggish and performed worse if she practiced too much, causing Mihoshi to internalize her ever-rising anger. 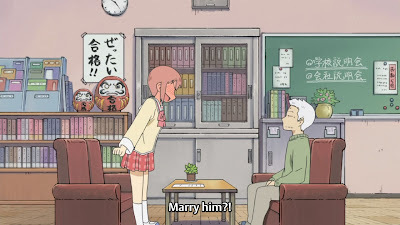 I commented on this for Yuri Yuri as well, with Kyouko being a genius: it's annoying in real life, but makes for good entertainment in anime! Mihoshi's brilliant plan to attack Yoshino when the older girl stopped to pet Sakamoto (continuity~) consisted of essentially hitting her as her back was turned. The references to the dojo's Master (dropped throughout the scene) was completed when Mihoshi actually hit the bike-riding Master passing by instead of Yoshino. I instantly realized that this was the strange-looking man that had imparted wisdom to Mio some episodes ago; it's so weird to see his old-school looks in a "modern" scene! Moreover, though, why would you ride your bike through two people like that?! Was he really pedalling that fast that the bike could continue without him? Weboshi and Fecchan showed up in a scene featuring their walk home from school, with some snacks. Weboshi dropped her meat bun without even getting to take a bite (I feel for her so much...). 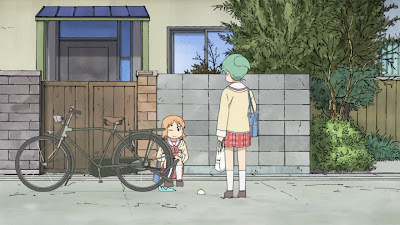 When Fecchan's attempts at consolation didn't work (by stating that some theoretical poison in the bun had failed to kill her this way), she attempted to retrieve the bun for her friend by ripping off a layer on the bottom (the dirtied part). Her own popsicle suffered much harassment, first falling out of her hands onto the meat bun (so it remained salvageable) and then just collapsing off the stick (due to the momentary heat of the bun). 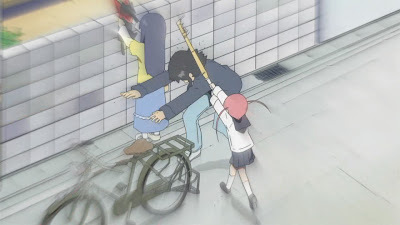 In a final scene, Master's bike (that kept on going when he was knocked off it by Mihoshi) rushed passed, crushing the popsicle pieces for good. My only question: are they on an incline? Otherwise, that's a very curious bike. Just looking at this makes me hurt. 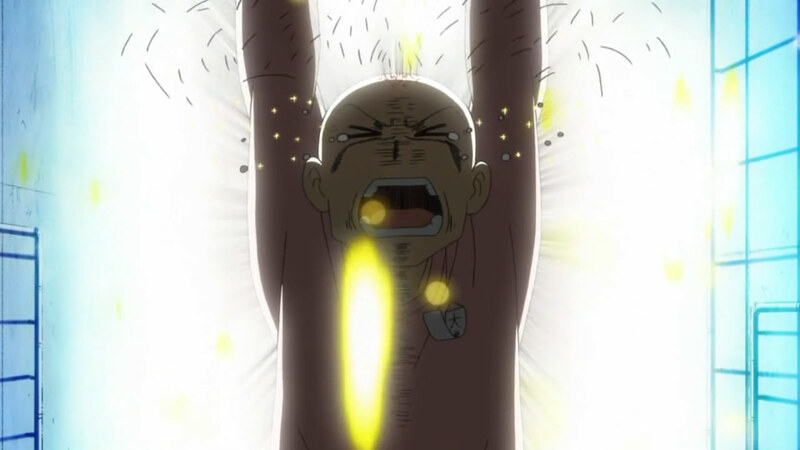 Nakanojo's tumultuous relationship with his father was further highlighted in another long scene (broken up twice, so it was presented in three parts). He didn't want to inherit his father's daifuku business (I thought it was a hobby!) and so wanted to duck out of his duties to "promote" (with a hilariously downtrodden balloon). His father, displaying quite a lack of safety, had foreseen such events and so had coated the inside of the Daifuku-kun head with fresh paint. Oh, come on. Other than questions about how Nakanojo was expected to breathe (I don't understand how he breathes in that head to begin with), it was still funny to realize that the boy was trapped...until he decided that his sheer willpower would see him through. I'm only sad about his poor hair; it had just grown back to a noticeable amount! Doki kept calling the leash a "lead". Apparently, it's a well-used term. 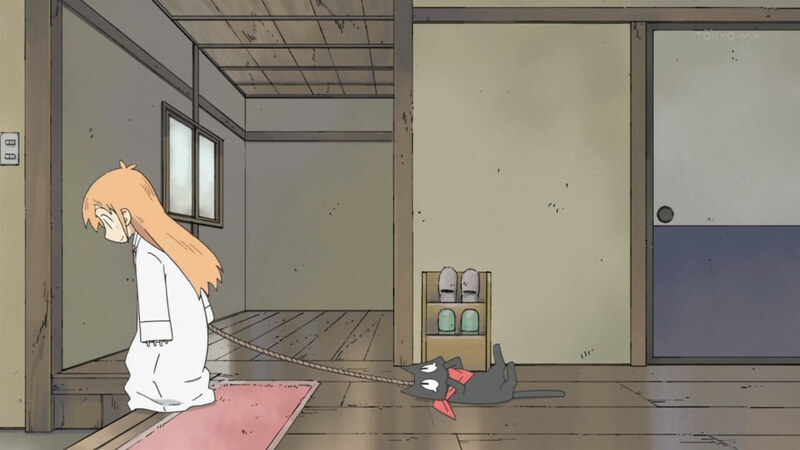 The final long scene of the episode began with Professor deciding to take Sakamoto out for a work. Ah, she really is a child, isn't she? It's hilarious how she put Sakamoto on a leash, as well. I was slightly worried for his health, seeing as how it seemed as though he was getting choked, but I've come to understand that it was just all the sudden tugging and whatnot. 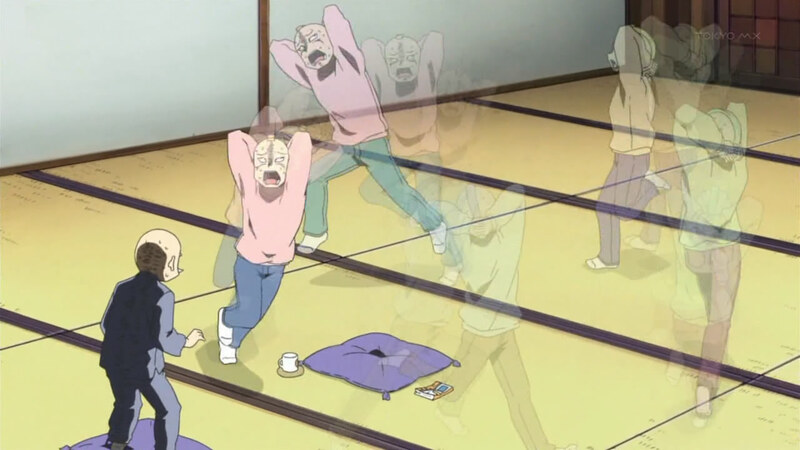 Anyway, as Sakamoto desperately tried to figure out what to use as a bargaining tool (he mistakenly thought that Professor was "torturing" him to get something), they ran into Mai - and her two dogs. 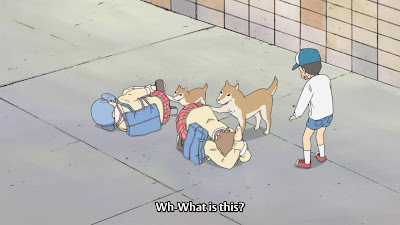 I had previously assumed that they were just normal dogs (just not "smart" like Sakamoto), but at this point something seems challenged about them (especially the white one). As a child and a cat, they became quite frozen in the dogs' presence - and Mai chose that time to disappear. How irresponsible! It's getting very hard to like this girl at this point. Mio and Yukko showed up (on their way to go hang out with Nano at the Institute), and tried to convince Professor that the dogs were harmless. Yukko, however, was bit by the larger one the moment she presented her hand to it, leading to a sky-piercing scream. 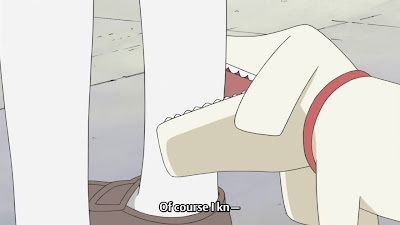 As Mio tried to explain away the biting (that Yukko was stupid and had probably agitated the dog), the white one snuck up to her and bit her leg (leading to another piercing scream, this time destroying the side of a building). Paralysed with fear (especially considering the two older girls actually had been attacked), Professor and Sakamoto were saved by Mai reappearing, asking demurely if they had played well. Come on. I can't stand her more now. Take responsibility for your dogs! There's a miniature one now! Professor and Sakamoto, upon seeing two dogs rushing at them, ran away in fear. However, the two dogs appeared to be Buddy and Ko-Buddy (Buddy's kid? 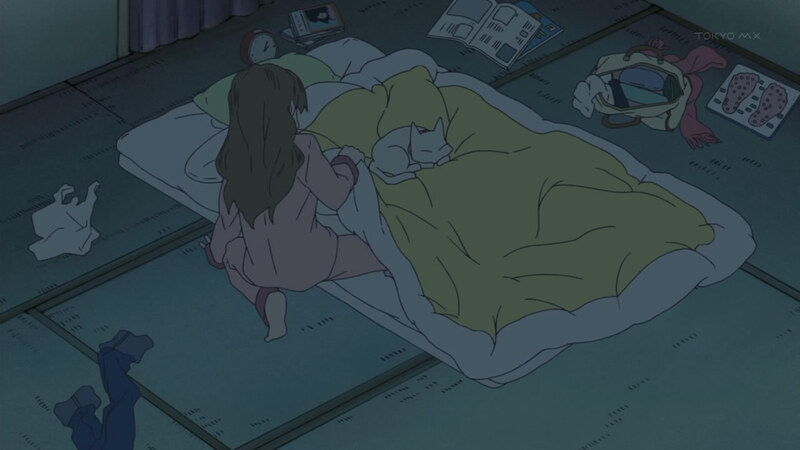 ), the former being the dog that's been consoling Yukko at especially difficult times. The fact that there's now a second one for Mio just took the cake for me. I actually didn't recognize the dogs until they lifted their paws up. Their owner (a school-aged boy) came running up, astounded by the sight in front of him. Even more surprising, the grandfather of the boy turned out to be the "magician". Where has he been all this time? I expected so much out of him! It's not too late, and I'm hoping that he'll show up more. 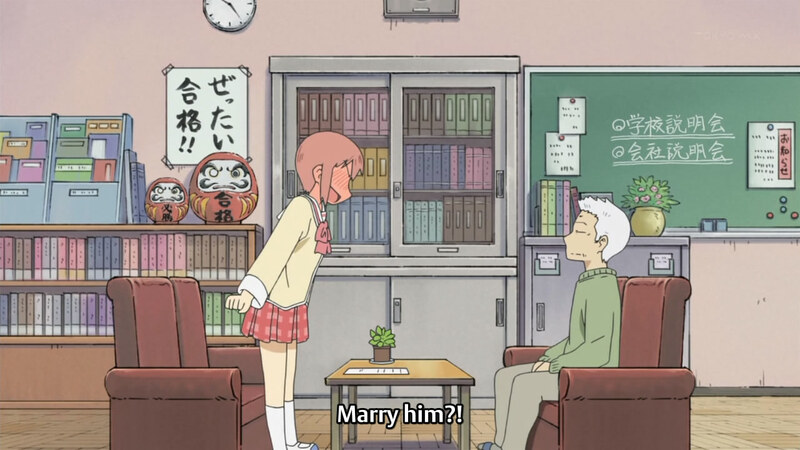 The scene ended with the boy correcting his grandfather's "pronunciation" of his name from "Takashi" to "Kiyoshi". So, I guess everyone knows about Tachibana and Sasahara. 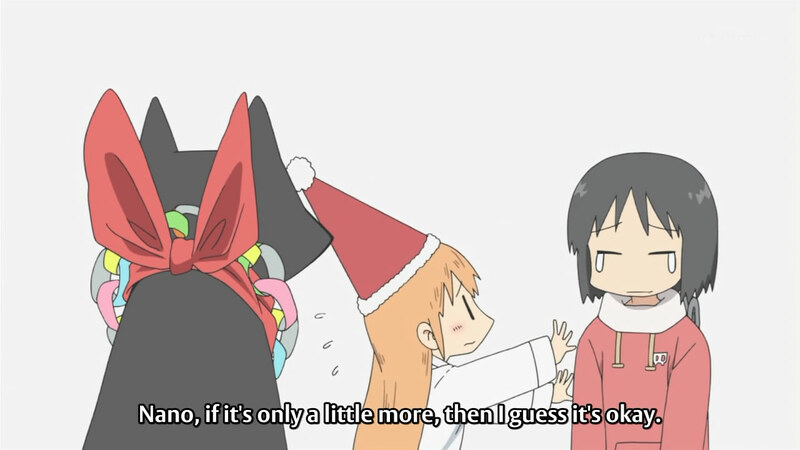 With such a strong episode this week, my interest in Nichijou has almost been rejuvenated. I'm really looking forward to what the last handful of episodes will bring. With many of the new characters getting tied together, I think there's now a good setting for outrageous things to begin occurring on a larger scale.